There’s much going on in Thor’s world, not least that she’s dying of cancer as Jane Foster, and Malekith has gathered forces strong enough to wage war on all known worlds. 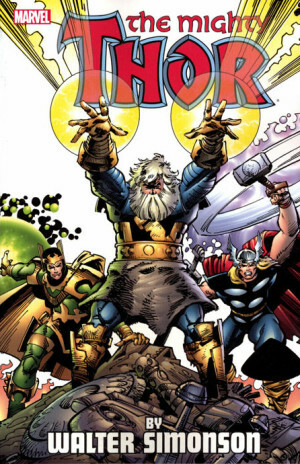 However, that’s not the starting point, which is a celebration of all that Thor is and has been across the ages, featuring a spectacular array of artists alongside regular Russell Dauterman. Jason Aaron provides a succession of interludes befitting their talents. It’s an embarrassment of riches to celebrate Thor’s 700th issue (in total), and to single just one artist is blatantly unfair, yet Chris Burnham’s Ego vs Galactus has to be seen to be believed. Matthew Wilson’s colouring throughout also needs to be mentioned, bold, bright and bringing the best out of Dauterman. That Aaron has so many plates spinning plot-wise has been frustrating over the previous six graphic novels, Malekith’s machinations starting in Goddess of Thunder, but don’t look for any pay-off here. Despite that The Death of the Mighty Thor is astonishingly good. As if the forces Malekith has gathered already aren’t substantial enough, he sets Mangog off in Asgard’s direction, and in the first instance he and guest artist James Harren display why it was necessary to spend so much time building up the title character in The War Thor. 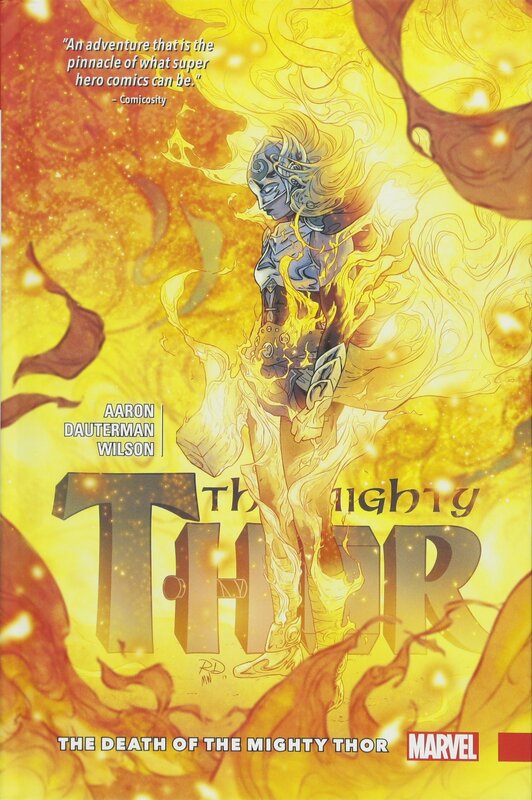 Thereafter Aaron and Dauterman grapple with a scenario that’s been seen before in Thor, that of stopping the unstoppable, yet they achieve a freshness despite a scenario some older Thor readers might consider repetitive and played out. They’d be wrong. Part of what makes this so powerful is the sheer brutality of Mangog. 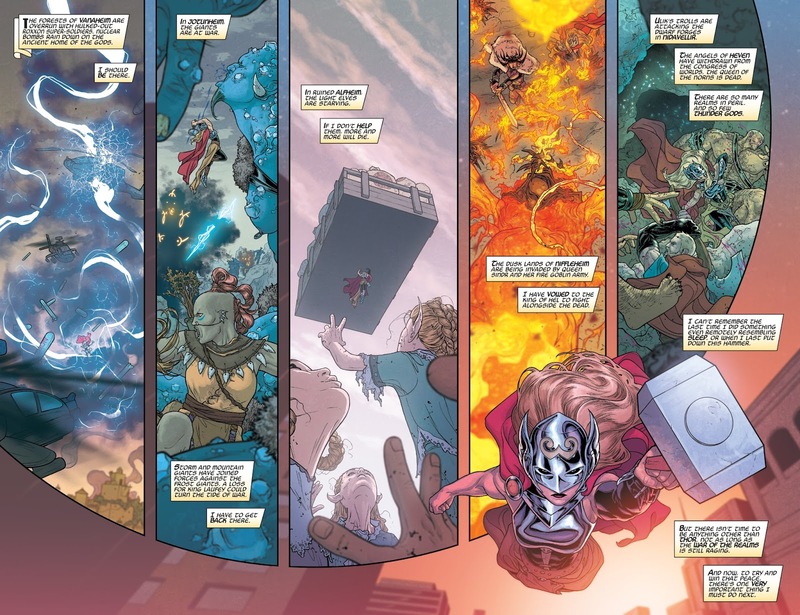 Aaron elevates it, and Dauterman and Wilson wipe our faces in it, able to do so more explicitly than earlier artists drawing Mangog setting about Asgard. Much of the pathos is down to Jane Foster, our Thor. Her cancer has been integral since the beginning of the series, and to Aaron’s credit he’s not offered a cheap and insulting solution of Asgardian miracles. She has cancer, it’s caused by her being Thor, and while there’s undeniable melodrama about her being forced into a position of having to choose whether to become Thor again, she’s also an inspirational figure in either identity. “We need Gods we can believe in”, she cries at one pivotal moment, “Tell them that. Tell all of Asgard. Tell them it’s time to earn the gift they’ve been given”. She’s come on quite the journey since her first, uncertain days, now unafraid to call out Odin as her disease-riddled self. That leads to Aaron concluding one long-running plot, disappointingly, with a whimper, but what surrounds it is first rate. 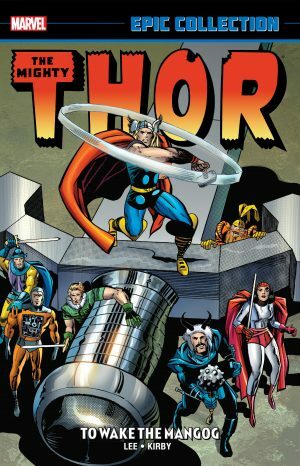 Should the Death of the Mighty Thor title be taken literally or symbolically? 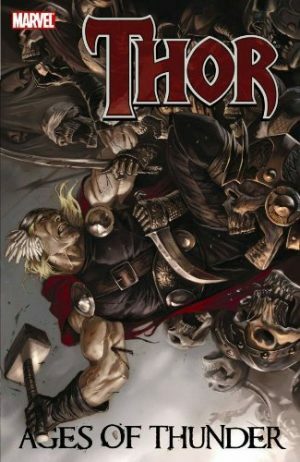 Are any Mighty Thors killed in the making of this book? Well, that would be telling, but in all incarnations of Thor he’s written Aaron has balanced the needs of an action plot with a humanity, and the conclusion doesn’t part from that viewpoint. The elephant in the room is Malekith and his machinations, which sees out another Thor series with no end in sight, and that has now stretched too far. 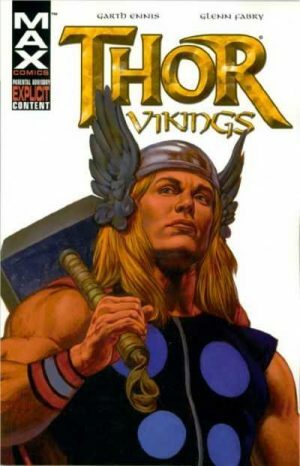 Aaron will be continuing to chronicle the adventures of Thor, with the classic version now back in the saddle, and it’s to be hoped Malekith receives some attention sooner rather than later.